We decided to plan an idea to build a new layout around two years ago not long after Roger Wilsons passing to sort of district us and give us a new project rather than just doing maintenance on Ramsbottom which can get a bit boring after awhile. 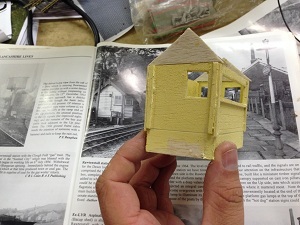 Originally we started building the scene Bacup Shed due to the shed already being built by Alan Garside. We soon realised that this was maybe a step too far and that maybe we should keep it simple. So this project was abandoned. One evening myself and Alex King came down to the club house and decided to dismantle the Bacup Shed layout. This included componet recovery for as track, points, point motors, wiring, buildings, turntable and any other usable parts, This will also save us money in the long run. The biggest problem with the layout was that the baseboards were made from MDF and do not hold up well in the damp conditions of the club house. At present the trackwork is starting from the station end (section 1) and working towards section 5. This will include up/down lines, sidings, wagon turn tables, bays, head shunts and loops etc. All the trackwork is laid on cork sheet which has to be glued with pva and panel pinned. All track work is currently being undertaken by Keith and Peter. This image shows Rawtenstall Station with the current track. There are two lines, a bay and 4 goods sidings behind the station. The Goods Warehouse is currently being worked on Alan Garside. This has included about 3 sections up to now that are made from Balsa wood. This includes the 4 entrance doors on the South side of the building. These sections have been covered in brick paper and window sills applied. 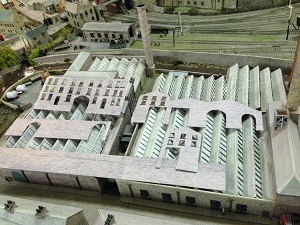 Rawtenstall Goods Warehouse currently awaiting assembly. 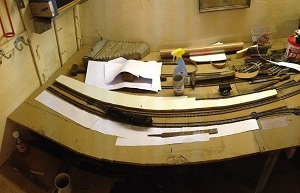 I have decided to try and attempt to make a model for the Rawtenstall Layout. This will be my first attempt at model making as i usually do the electrics. I thought i would start small and produce the Rawtenstall Signal Cabin that was located next to the Down Line. This is not a big building and will require repainting in a more suitable colour. Rawtenstall Signal Cabin as located on the Down Line adj the Platform. Seen here compared to the real thing.